Why do dogs eat grass? Why do cats not use the litter box? How do I know what is the best pet for me? What do you mean there is no such thing as a free kitten? Now that I have your attention, I would like to start a blog that I hope will help educate pet owners about a variety of subjects. In 1988, when I got my Doctor of Veterinary Medicine Degree, I never imagined how much change I would see in my lifetime. The thought that someday I would write a “Blog” never crossed my mind. Of course that word was not even in a Webster dictionary at that time. My bio is printed on our website at Winterset Veterinary Center so I do not intend to repeat that information. I do live in a small community of about 5000 people but the information shared here should apply to all pet owners. I decided to start a blog since often I get asked the same questions or I hear the same issues from clients. I have always felt that one of my strongest assets is my ability to educate people about pets. I enjoy my time in the exam room getting to know my clients and their pets. 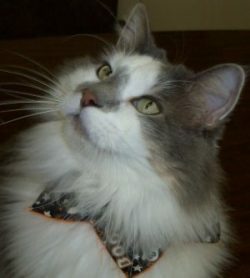 I hope as this blog gets shared that you may find helpful information that could improve and extend the life of your pet. I intend to start slow and make certain that at least once per month I post a new blog. I plan to begin with the basics and then as I get a feel for my audience adjust where needed. I can be reached at the Winterset Veterinary Center if you ever want to offer suggestions or topics. I cannot guarantee that I will alter my direction but am always open to ideas. I want to clarify that I am not claiming to be an expert. I am not hoping to become the Dr. Oz of Veterinary Medicine. 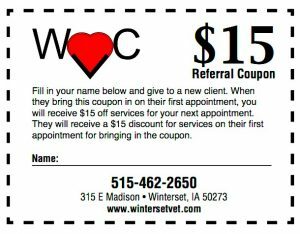 I just have knowledge and advice that has often been appreciated by those who see me at Winterset Veterinary Center. All the information available at the click of a button can leave one overwhelmed and confused about pet care. My goal is to be practical so you can make decisions about your pets. I hope you will follow me on this journey or at least stop by on occasion if there is something that peaks your interest. We all have one thing in common, that pets improve our life just by being in it!